As the WolfPack women’s soccer team inches closer to the end of their season, they have found themselves on the bubble and each win, loss or tie suddenly means so much more. The team’s play this weekend, which includes a tie with the Pronghorns and a decisive loss to the Dinos, means they’ll have to work that much harder in their final weekend. A cold and rainy Oct. 14 at Hillside stadium saw the women’s WolfPack soccer team play to a two-all draw against the Lethbridge Pronghorns. Early play was cagey, with both sides maintaining a tight and scoreless defense. 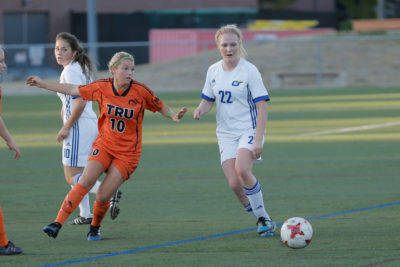 The deadlock was finally broken in the 18th minute of play when Penticton’s Marisa Mendonca scored in a stunning long-range effort, her third in as many games. The Pronghorns took advantage of an error by the ‘Pack’s goalkeeper and evened the score four minutes later. It was an unfortunate turn of events for TRU, as they had been in control and had played well up to that point. The teams went into half-time at one goal each. TRU was then forced to desperately chase the game trying to restore parity. It looked as though this was the game that got away from the ‘Pack, but the team refused to give up and fought to the very end. The WolfPack team was rewarded in the 88th minute with a penalty shot, coolly put away by Marisa Mendonca. With four goals in three games, Mendonca continues her purple patch. The final tie score was a fair result as both teams were evenly matched. After the game, The Omega caught up with proud team coach Kelly Shantz. Although he felt that they were unlucky to have been tied at half-time, he spoke of how amazed he was with his team’s fortitude throughout the game, at the passion his players show and the fact that they continue to learn and improve. The team’s play on Sunday was no improvement. The game began similarly to the one against Lethbridge, with the ‘Pack keeping a good shape defensively and getting numbers behind the ball. It felt like a game of chess with the Dinos dominating possession and the ‘Pack trying to create chances on the counter attack. Calgary’s Kelsie McDonald scored three goals at the 78th, 83rd and 90th minute, she’s now scored five goals this year. Maddison Fritze had a goal and three assists, while the Dinos defense managed to keep a fifth clean sheet for the season. Shantz spoke to the Omega after the game. “We had to be on top of our game, no question. Calgary have an experienced coach and a lot of veteran players. They came in wanting to make a statement. They probably had an easier day yesterday in Kelowna than we had against Lethbridge,” he said. This game puts the women in a must-win situation as they will face off next week with the UNBC Timberwolves, who, like TRU, will be vying for that sixth and final playoff spot in the division.